It's been an awesome week since we released best Joomla Page Builder Quix 2.0 Alpha. With all the excitements and achievements we are here with a remarkable progress. We are just in time for our next launch. Appending some more clever features we release Beta version of Quix 2.0 Joomla Page Builder. This version is much more improved and this time the layouts are far better than the expectations. But we are still developing Quix 2.0 Joomla drag and drop page builder for better performance and new functionalities. Quix is still on the lab and there might be some minor bugs, which we'll be fixing them in the upcoming versions. 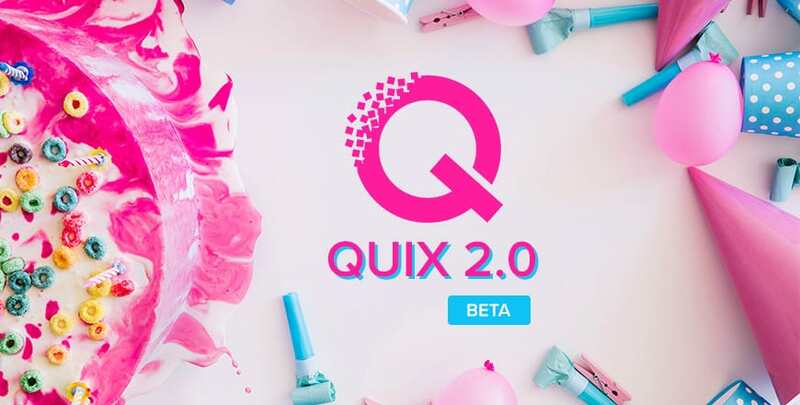 Please go through with each new feature detailed below of Quix 2.0 Beta. Just give a quick scan and get familiar with each of them. In the meantime we'll work on with our next release. Together we'll make Quix 2.0 the best Joomla Page Builder one's ever known. ​Column Resizing means to resize the the default column layout. Quix page builder gives you the ultimate power to resize the column to your desire. It was never so much easier as now. The new version of Quix offers pixel perfect layouts and now you can resize them easily and smoothly. The columns are built on percentages. Just drag the side of your column and expand or shrink it just the way you want and we promise, it won't break the row. Don't believe us? Why not try by yourself and test it. ​Quix 2.0 has transformed completely as the settings are much more easy and flexible. After the section selection and column selection, you'll be able to edit the column settings. At the top-left side you'll get the editable options in a mini-toolbox. Here you'll get 4 options- General, Styles, Animation and Advance. These settings will allow you to change the default settings and make your own creative styles for the developing site. ​Quix Joomla page builder makes easy to create beautiful responsive page layouts with the fast drag-&-drop gesture. Quix is the best free Joomla page builder that gives you the total control from designing to managing, everything can be done easily with Quix. Till now you have been customizing the typography from templates option. Now, you do not need to worry whether the template will provide you typography options or not. Because Quix will allow you to do so. A form cannot be submitted without a button. It not only links to other sites but also enables to store the data in database. So, we customized the button settings with ready-made buttons with editable functions. You can change the style, font, size, shape etc as it comes with 3 different settings- General, Styles and Advanced. Headings always attract the viewers. If the header is not attractive then you might have less than average traffic in your site. Quix 2.0 is designed holding each and every element in details. The heading element has all the functions to make a header bold and attractive. It has styling, linking, color, typography, element style, background etc. Make the full use of it and let us know. Image is a necessary element for any website. It is proven that images works better than texts. Your explanation directly hits viewers mind faster with images rather than texts. With quix you can insert an image directly or generate it form any external link, that's totally up to you. Besides we know everyone like it a bit unique, so we have provided elegant customization's along it. Hope you like to use our new element. Text element is very much important. It helps to get more traffic via SEO. Text helps to describe anything in details. If the text is not appropriate and attractive then it does not increase viewers interest. We know how much text element is important for you so we tried our best to make it better. Our text element comes with advanced typography, so that you can customize text in your way. "Faster and quick response" is the first expectation a user expects from a website. And a site can be made blazing fast by improving the cache system. Cache shows the web pages without pulling them from database every time a user asks for them. Quix Joomla page builder is 3X, faster as we updated the cache system. Now the buffering won't bother you and keep you waiting as the pages will load in seconds. The better is getting best. Quix 2.0 Joomla Page Builder is very much sorted and improved. We are still working over it but we promise not to keep you waiting up late. Meantime why not give a test drive and send us your feedback. If you wish, you can check out Quix releases and what new is introduced with each release, from below. I have a subscription to Quix, why dont I have access to this beta? i was asking myself the exact same thing! Me as well! Don't see it in my downloads ! Why not? We want to make the first impression look good, that's why we are not providing download options. But we promise we will provide you a downloadable package from RC release, till then stay tuned. - Labels are for internal reference, we may remove it on future release. This is good news as Quix was already at best and a pleasure to use, it will be awesome. You got 404 error while login before comment ? I just found it. Or there are more ? Mind sharing ? 1. Example : I made a 2 columns ( A, B) row, resize the column A and add 2 columns(C,D) in B.
Resizing is % gives more flexibility over grid. We'll give an input box for column width so you can put exact value you want instead of drag the col. Hope this makes sense. Is this not tedious to adapt for different screen? With the 1/12 ... system it seem more easy to manage than % - even if it's less flexible. one thing I would like to see soon is ability to move the settings dialogue box. At the moment it opens screen centre hiding what is being changed behind it and cannot be moved. (least not by me). I expect you guys will be adding a pin dialogue box to side etc at some point in the future but for now ability to drag it 'out of the way' would be great! Is it possible to make an element list on the left side of the screen and the settings for elements on the ride side? Then it would be possible to drag an element from the left side box in the layout. If i click on an element the settings on the right side are accessible and editable with just 1 click (please take a look at Pagebuilder 3 from JoomlaShine ). 2. Resizing colums in % are good, but ONLY with 1% - 100% and NOT 44,44 or 66,66 (see Gantry5). This could make it easier to drag to a good position. 1. Yes possible but we may not do it. I saw this one PB3 from JS and I believe it's not good UX practice( You may like it no offense).